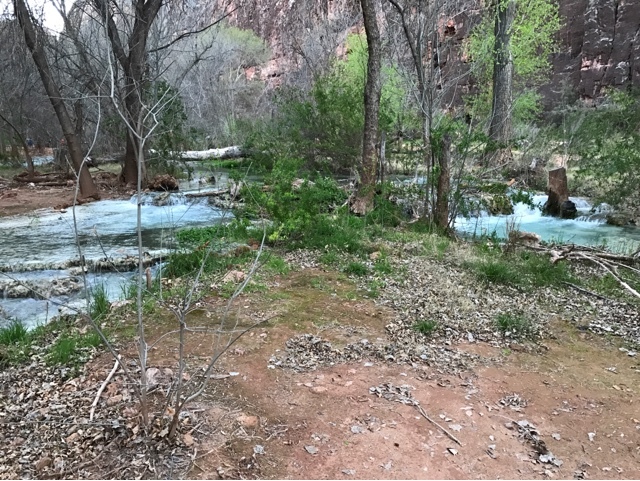 The Havasu Falls Hike generally results in staying at the campground along the Havasu Creek. 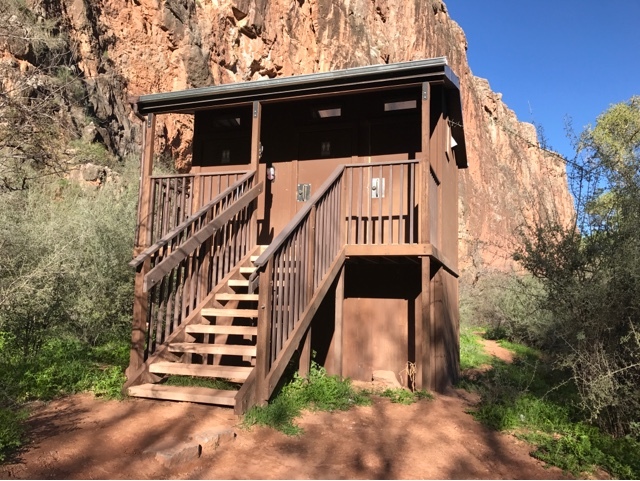 The other option is to stay in the Lodge in the Supai Village, 2 miles away. I like to drop pins on my google maps to keep track of things and where they are. I know lots of detail but that's me. I also download the google maps I need offline so when out of cell service I have my data. 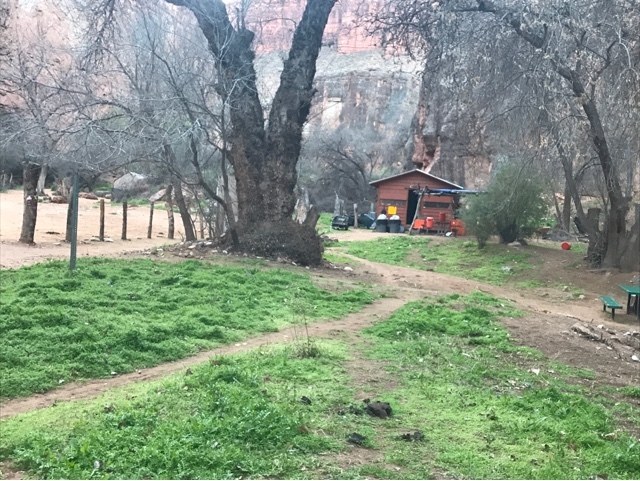 Joanne and my campsite was in the first 1/4 of the campground closest to Havasu Falls. 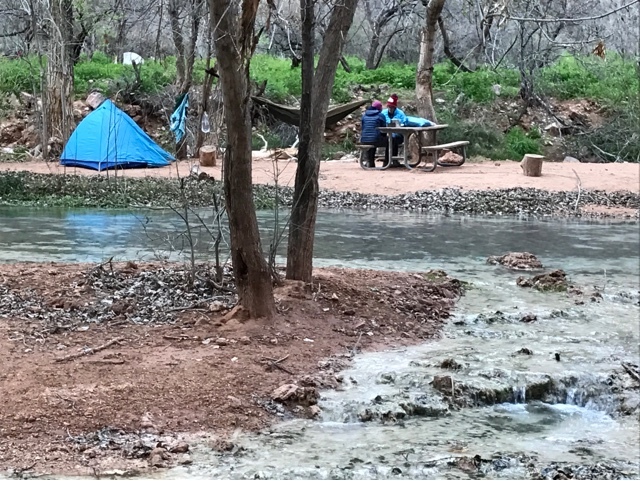 All campsites are along the beautiful blue Havasu Creek. 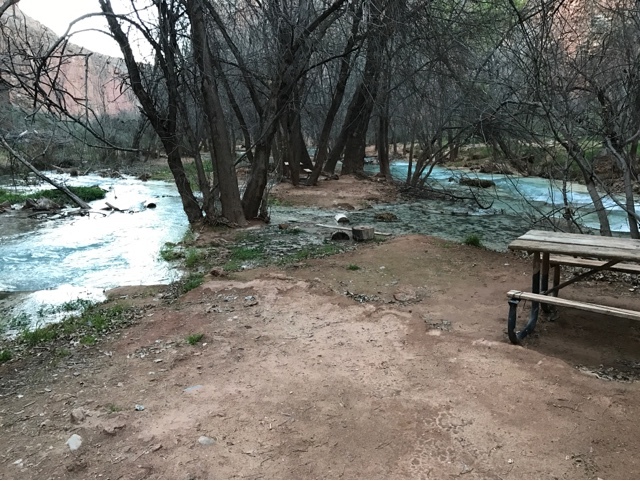 Campsites include a picnic table and as we did you can share sites, with one person's reservation. 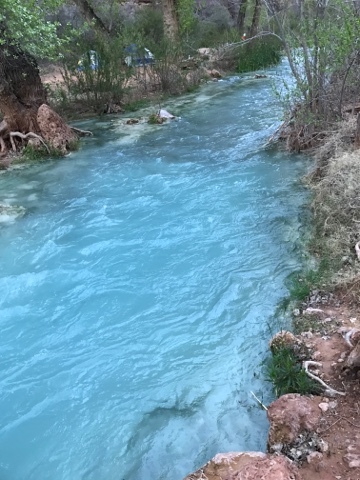 Here is the beautiful blue water passing by our campsite. Further down the Creek are more campsites right on the water. A flash flood would not be fun here. 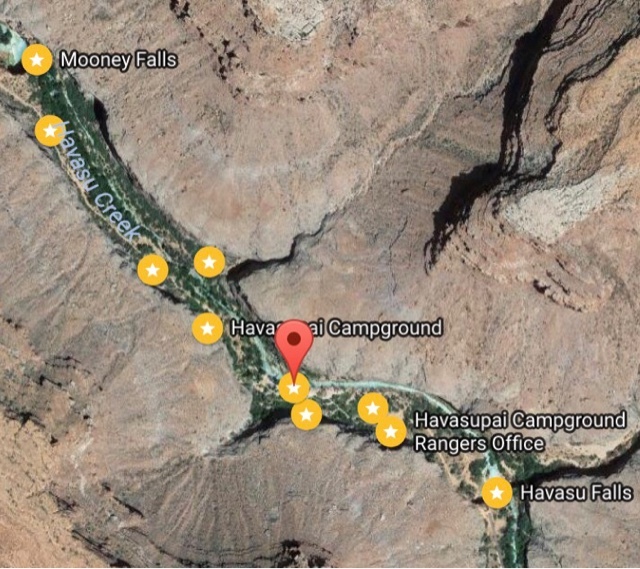 There is a High Ground sign near Havasu Falls to gather during flash floods. There is a camp host of sorts (Ranger's Office on map) that does not deal with reservations to camp but does deal with issues and arranging packingbout your equipment the day of hiking out. Some of the sites at lower levels have stones or wooden planks to get to these sites on the other side of the river or in this case in the middle. No matter where you put your tent it's beautiful! 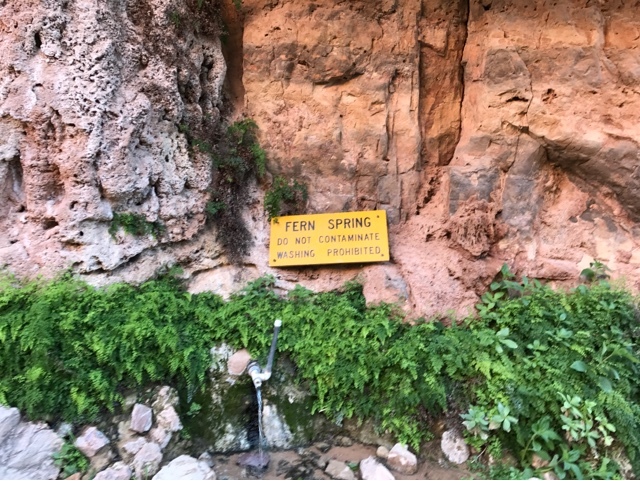 We camped near the fresh water spring for easy access. I used a small dry bag as a water container to use at the campsite. The spring is supposed to be tested monthly but we used it in boiling to reconstitute dehydrated food so that was ok. For drinking I put water in a bottle and killed any possible bad stuff with my steri-pen with ultraviolet light. We did drink water from the river where we have the last water before our hike out. This too was all sterilized with the steri-pen I carried. Bathroom facilities are composting toilets. There are 3 of these on the main side and one in the other further down. As you notice I did respect the Supai population by not photgraphing them. 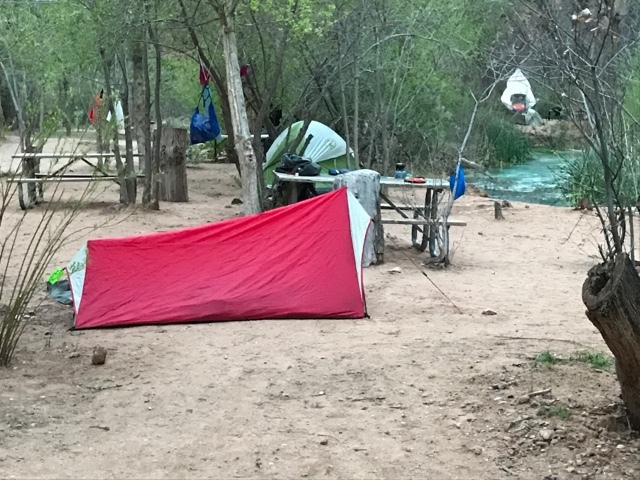 There are two vendor tents near Havasu Falls and Camp Host that serve fry bread, tostadas, etc. One night we shared a fry bread. They have drinks too. Note that prices reflect the difficulties bringing food into the canyon on mule train, but they are not outrageous. There is a market in the Supai Village along with one snack stand and a small cafe. We did not eat at these or go in as it was a 2 mile hike to get there and then 2 miles back to camp. We were built sightseeing and carried all our own dehydrated food packages.